MITSOM College NSS Unit is headed by Prof. Sadanand Borse, N.S.S. P.O since April 2013. 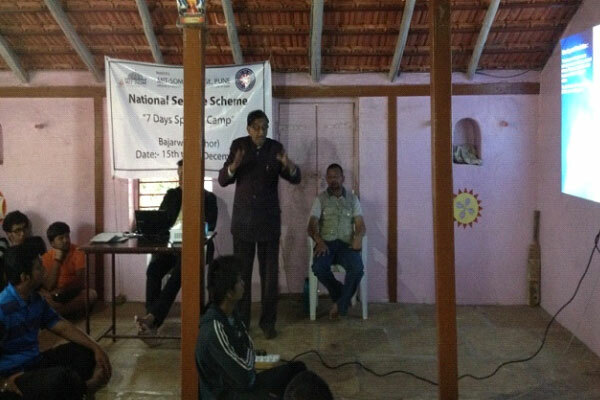 Like every year this year also MITSOM College had arranged a Seven Days Residential Camp for N.S.S. Volunteers in Bajarwadi village, Tal. Bhor, Dist. Pune from 1st December to 7th December 2016. 76 volunteers participated in this camp. As per the planed schedule all selected volunteers reported N.S.S. Program Officer Prof. Sadanand Borse at the college at 06:30 am on 1st December 2016. We started our journey sharp at 07.15 a.m. and reached the venue of the camp – ‘Bajarwadi’ Village, Tal. Bhor, Dist. Pune, at 9.00 a.m.
We had a warm welcome by the villagers. Sarpanch Mr. Sankhar Yadhav gave two houses for our stay whole heartedly. Also they allowed us to use temple area for our Special Program. After cleaning these houses and the temple area camp setup was done. The core area of work was shown to all volunteers while interacting with villagers. Villagers gave us the helping hand by allowing us to use their toilets .Volunteers helped the cooks to prepare the lunch. After lunch volunteers made arrangements for the Inaugural Program at village temple. Along with Upasarpanch of the village, ex-sarpanch, and villagers were present. In the evening from 5 to 7 pm all the volunteers visited the village to know the village, farms and crops. 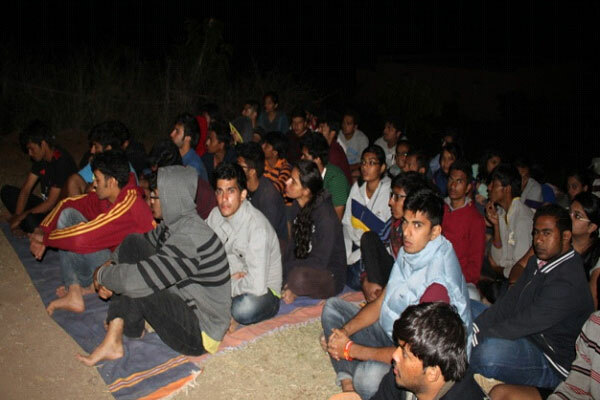 After Diner we showed a documentary “Devakinandan Gopala” to villagers. This documentary is based on the life of Saint Gadage Baba, giving a message about importance of cleanliness (Gram Swachhata). The day ended with diary writing session at 10.00 p.m. Spreading awareness washing of hands, cleanliness, use of toilet, education, etc. 2nd Dec “Disaster management” – Dr.Anil Dandekar, Ret. Principal MIT College, Pune. 3rd Dec. “Mindfulness" – Ms. Manasi Kshirasagar, Pune. 4th Dec. “Fort Rohida” and life Brainstorming Session by Godreg . Fourth Session of every day was an interactive session where different activities were conducted. 3rd Dec. Visit to Rohida Fort. 4th Dec. Interaction with villagers, Data collection. Fifth and last session of every day was of diary writing. All the volunteers wrote their diary every day. After diary writing session at 9:90 pm it was the time for students to go to bed for a good sleep with a great experience they had achieved throughout the day. On 6th Dec. a cultural program and camp fire was organized by the students where they showed their singing dancing and drama talent. On 7th Dec. evening stock audit was conducted by the non teaching staff Mr. Mahesh and Mr. Suresh with one N.S.S. volunteers. On 7th Dec. i.e. the on 7th day after shramadan session in presence of Sarpanch Mr. Tushar Shind sir and Mr. Shankar Maharaj sir and villagers, valedictory function was organized. They all praised volunteers and their work and invited us for the camp next year. After having lunch with all of them we all had a chat with villagers, all the volunteers returned to college campus the same day evening safely with a lot of good experiences. 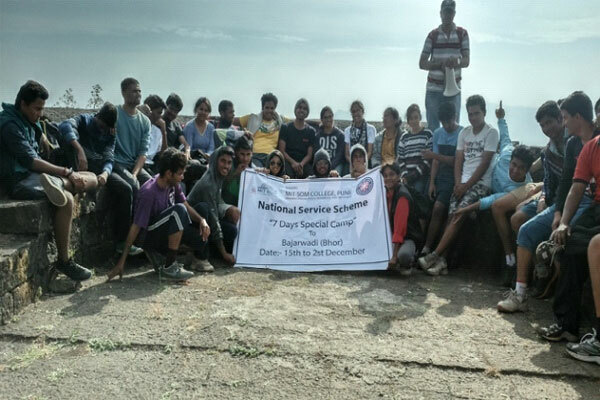 Like every year this year also MITSOM College had arranged a Seven Days Residential Camp for N.S.S. Volunteers in Bajarwadi village, Tal. Bhor, Dist. Pune from 15th December to 21st December 2015. 55 volunteers participated in this camp. As per the planed schedule all selected volunteers reported N.S.S. Program Officer Prof. Sadanand Borse at the college at 06:30 am on 15th December 2015. We started our journey sharp at 07.15 a.m. and reached the venue of the camp – ‘Bajarwadi’ Village, Tal. Bhor, Dist. Pune, at 9.00 a.m.
17th Dec “Disaster management” – Dr.Anil Dandekar, Ret. Principal MIT College, Pune. 18th Dec. “Mindfulness" – Ms. Manasi Kshirasagar, Pune. 19th Dec. “Fort Rohida” and life Brainstorming Session by Godreg . 18th Dec. Visit to Rohida Fort. 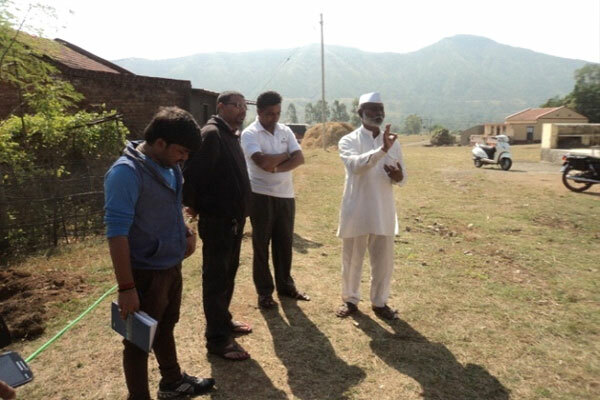 19th Dec. Interaction with villagers, Data collection. On 18th Dec. a cultural program and camp fire was organized by the students where they showed their singing dancing and drama talent. On 20th Dec. evening stock audit was conducted by the non teaching staff Mr. Mahesh and Mr. Suresh with one N.S.S. volunteers. On 21st Dec. i.e. the on 7th day after shramadan session in presence of Sarpanch Mr. Tushar Shind sir and Mr. Shankar Maharaj sir and villagers, valedictory function was organized. They all praised volunteers and their work and invited us for the camp next year. After having lunch with all of them we all had a chat with villagers, all the volunteers returned to college campus the same day evening safely with a lot of good experiences. 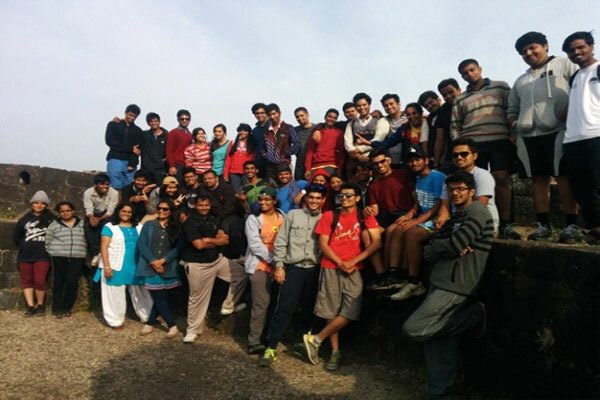 Like every year this year also MITSOM College had arranged a Seven Days Residential Camp for N.S.S. 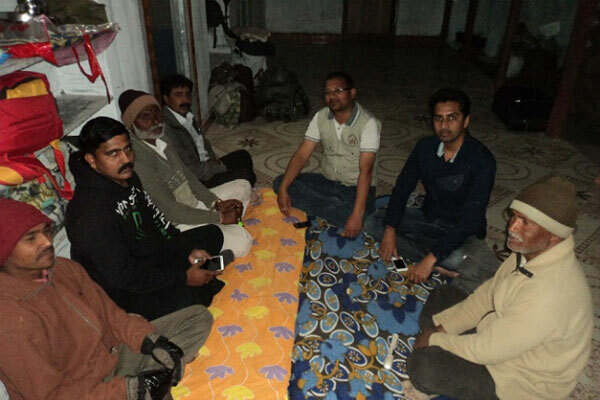 Volunteers in Bajarwadi village, Tal. Bhor, Dist. Pune from 15th December to 21st December 2014. 55 volunteers participated in this camp. 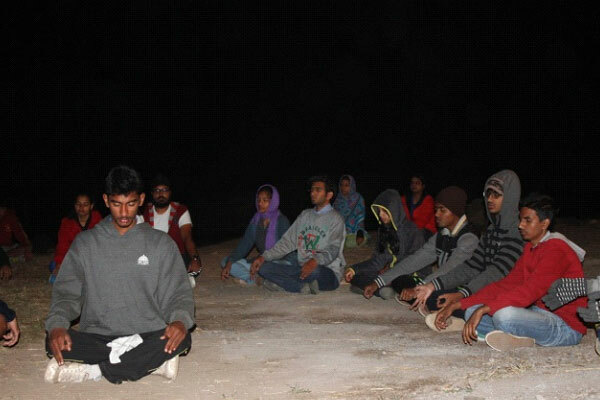 On 15th December 2014, an orientation Program was held and all the instructions about the camp, camping place, responsibilities of the participants etc. were given. On 15th December 2012 all volunteers reported for final instructions and details. Principal Dr. R. M. Chitnis guided encouraged all the camp volunteers. As per the planned schedule all selected volunteers reported N.S.S. Program Officer Prof. Sadanand Borse at the college at 06:30 am on 15th December 2014. We started our journey sharp at 07.15 a.m. and reached the venue of the camp – ‘Bajarwadi’ Village, Tal. Bhor, Dist. Pune, at 9.00 a.m.
We had a warm welcome by the villagers. Sarpanch Mr. Tushar Shindi gave two houses for our stay whole heartedly. Also they allowed us to use temple area for our Special Program. After cleaning these houses and the temple area camp setup was done. The core area of work was shown to all volunteers while interacting with villagers. 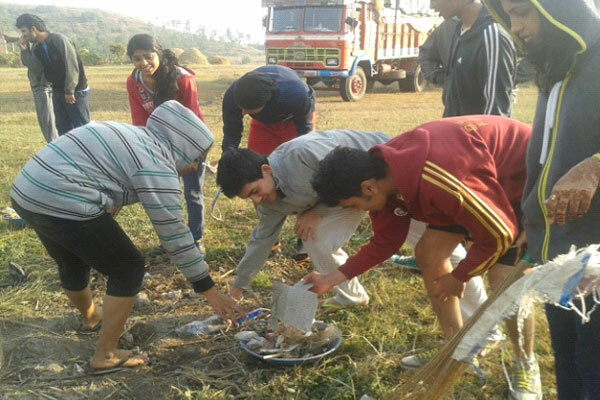 Villagers gave us the helping hand by allowing us to use their toilets .Volunteers helped the cooks to prepare the lunch. After lunch volunteers made arrangements for the Inaugural Program at village temple. Along with Upasarpanch of the village, ex-sarpanch, and villagers were present. 19th Dec. “Fort Rohida and life style of shiiviji maharaj” Shankar Maharaj. 4th Dec 2013 - “General Introduction and Lecture” by Sarpanch, Kule, Pune. 5th Dec 2013 - “General Medical Checkup Camp” by Dr. Chavan, PSI Blood Bank, Pune. 6th Dec 2013 - “Lecture on Disaster Management” - Anil Dardekan. 7th Dec 2013 - “Bhaktirasatun Samajseva” – Mr. Joshi, Kothrud, Pune. 8th Dec 2013 - “Importance of Mental Health of Youth” – Ms. Manasi Kshirasagar, Pune. 9th Dec 2013 - "Importance of Yoga" - Mr. Rupesh Thopte, Ambedkar College, Aundh. Like every year this year also MITSOM College had arranged a Seven Days Residential Camp for N.S.S. Volunteers in Nanegaon village, Tal. Mulshi, Dist. Pune from 27th November to 03rd December 2012. 58 volunteers participated in this camp. Donation of Books & Computer to the college school. 27th Nov 2012 - “General Medical Checkup Camp” by Dr. Chavan, PSI Blood Bank, Pune. 28th Nov 2012 - “Role of youth in social change making” - Sayali Tamane and Dhananjay Muli. 29th Nov 2012 - “Importance of Yoga in Student Life” – Mr. Rupesh Thopte, Ambedkar College, Aundh. 30th Nov 2012 - “Mindfulness" – Ms. Manasi Kshirasagar, Pune. 1st Dec 2012 - “Bhaktirasatun Samajseva” – Mr. Joshi, Kothrud, Pune.